If you can’t read that tiny font, that’s 2,306 feet of ascending per loop for a total of 4,612 feet of climbing. 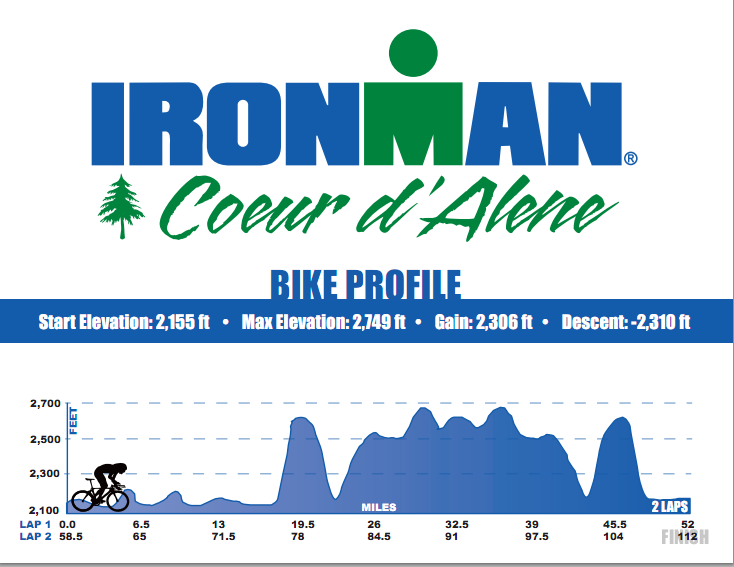 Every time we tell someone who is familiar with Ironman that we are doing CdA they always say “lots of climbing!” or “tough bike course” or something to that effect. They also would say “very technical course” but luckily, the new route has removed a lot of the crazy twisting turns that used to make CdA a very technical bike course. I was relieved when this change was made since I’m a fairly new rider and not very comfortable with tight turns. In order to prepare for CdA, we will be biking solely on hilly routes. While training for the marathon, we’d do some flat coastal rides to keep our legs fresh, but now that we are focusing on the bike portion of the race rather than a marathon, it’s time to ride those hills. Mike mapped us a 61 mile route that began with our beloved Pizza Port route and then took us up a very large hill called Del Dios. The route has 2,441 total feet of climbing, which is just slightly more than CdA. We knew that this ride would be a good reflection of the race course. Not only would this be the longest I’ve ever ridden, but also the most climbing I’ve ever done. However, I set out feeling good about it and ready to conquer this beast. On Friday after work I had my bike refitted (I hadn’t had it done since I got the bike and I also got a new seat in the meantime) and also bought some CarboPro and Nuun. My nutrition plan was 200 calories per hour, with the assumption that I’d be finished in 4 hours. I had one water bottle with 200 calories of CarboPro and a 1/2 tablet of Nuun to start and carried with me a baggie of 200 more calories and the other half of the Nuun. I also brought 2 Stinger Waffles and 1 Gu with me. The Gu was to be taken at the end of the ride just before the 4 mile run. And yes, I still don’t have a pair of cycling glasses. I’m working on it! Once we made our way up the next hill we got onto Del Dios highway, which is basically a series of massive hills (miles 29-38 on the map above). I focused on keeping my heart rate within zone 2, which for me is 150-170. At times it was pretty close to 170, which is not good. I was in my easiest gear and still felt like I was cranking at some points. There was definitely no option to just “spin” up the hill, like many suggest. Getting to the top was a relief and the boys were waiting for Asia and I there. We continued on through the back side of the Elfin Forest, which is a popular hiking spot for locals. Although the majority of this section was downhill, there were some pretty steep hills mixed in which at this point were not easy to get over. There was one last steep hill just before we hit “Pleasantville” which is this town that looks like the stars of Desperate Housewives live in. All the shops and restaurants are brand new and there is a big, immaculate park in the center of the city square. The houses look like they were made from a cookie cutter. We stopped here for the restroom and to refill our water bottles and eat (and take pictures). Now we were in the home stretch. We made our way down more hills and even up a few more, and then ended up back on the end of our normal Pizza Port route. Although my quads were tired, overall I felt pretty good during the home stretch. I had taken in all of my calories except for the Gu and was feeling good. As soon as we hit the coast, with 2 miles to go, I took my Peanut Butter Gu (so good – tastes like you are just eating a tablespoon of PB but easier to eat). 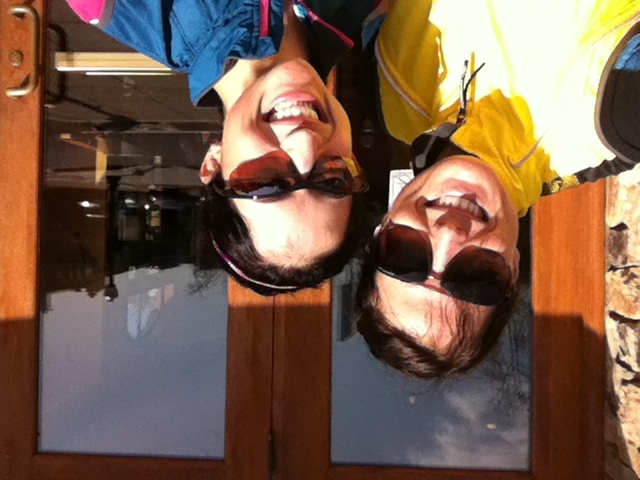 When we got home, we put on our running clothes and set out for a 4 mile run. As it seems to usually be the case, Asia and I went out and maintained a good pace, ending up with an average overall of 8:44 min/miles. Although this ride took us longer than I had hoped (5 hours including stop lights, 4 hours 15 minutes total ride time – including lots of slowing for stop lights and stop signs), I felt like it was reassuring that I’m ready for the half Ironman on March 31 (which only has 1,600 feet of climbing). It was also a valuable lesson in the difficulty of the CdA bike course. 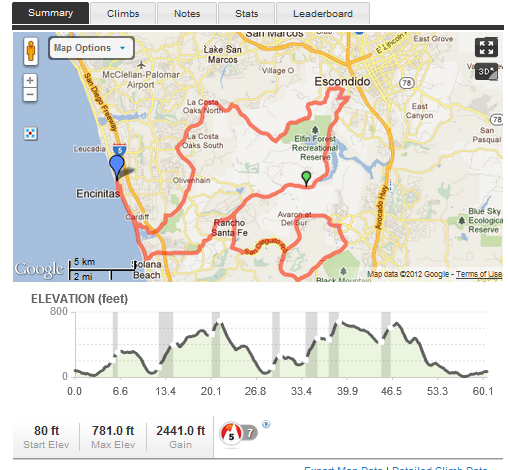 A 60 mile route with 2,500 feet of climbing is extremely different from a 60 mile flat route. I feel very fortunate to have access to so many hills so close to my home! We don’t even have to drive anywhere to ride a course similar to our race course, which is definitely an advantage. I tried not to get too discouraged about the length of time it took us to complete the route since I know that race day has a lot fewer obstacles like stop lights and stop signs. 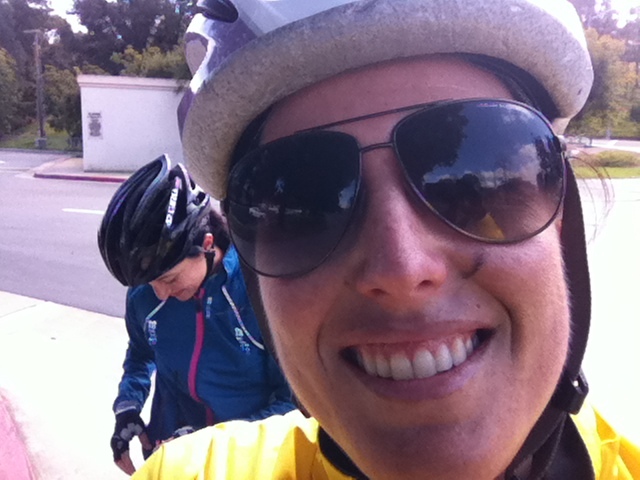 I was also happy that I didn’t really “bonk” on this ride – my 800 calories of fuel seemed to do the trick. After the half Ironman, I may start increasing my calories a bit on the bike since I will have to run a full marathon after I get off. I’m still working on that plan! Do you ride a route that is similar to your race course? If you are doing CdA, what do you think about the new bike course? Katie, I agree with you – I love a challenge. wow, sounds like you had a great (tough) day out there – well done!! 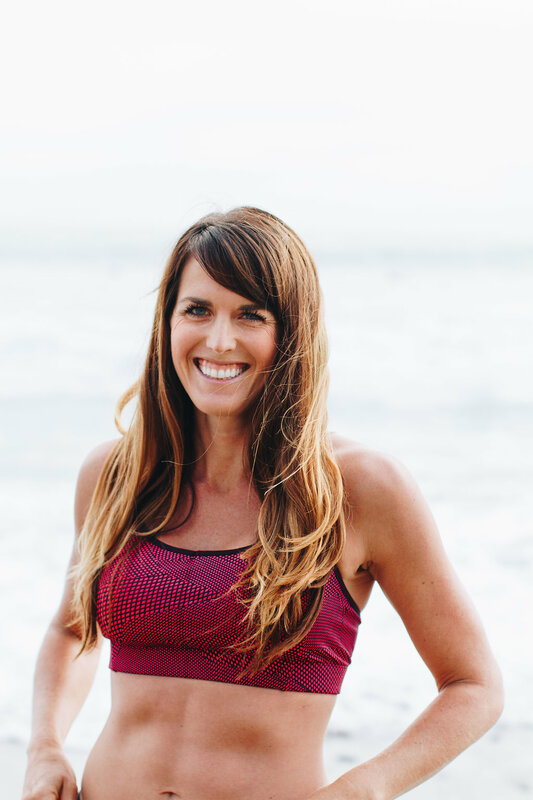 Hey Nicole – best of luck as you train. I do have one question – if you had one piece of advice for IM CDA what would it be? Since I haven’t raced it I couldn’t say! 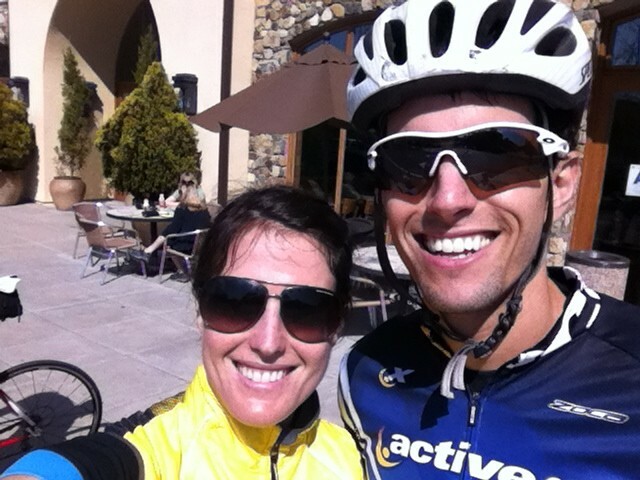 But from what I’ve heard, it’s practice your nutrition and make sure to bike easy, especially in the first half. Hope that helps!